Honey bees have very small brains—yet they are highly intelligent and it is more than instinct. The intelligence resides in the individual bee; there is no "hive-mind." If this information is new to you, you will never look at these tiny creatures in the same way again. 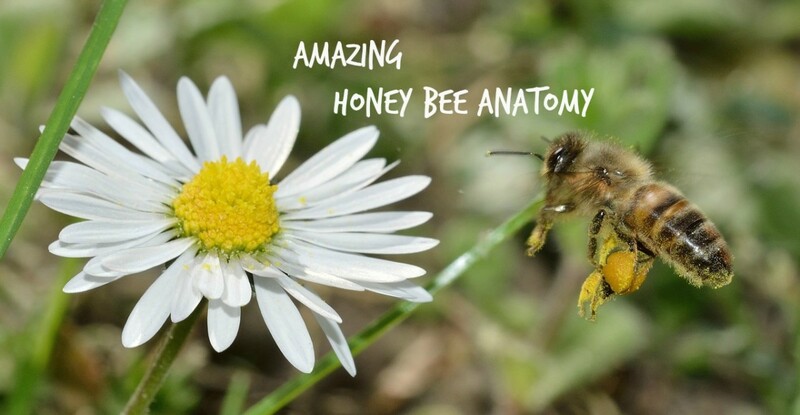 What Are the Characteristics of Honey Bees’ Brains? Their brain is about the size of a sesame seed. It measures just one cubic millimeter. Their brains may be tiny, but they have larger brains and more neurons than other insects of similar size. They compensate for their small brain size with greater brain density. Their brain is ten times denser than the brains of mammals. They have a sophisticated sensory system which gives them excellent sight (including the ability to see ultra violet and polarized light.) and keen smell, taste, and touch. Their brains appear to have neuroplasticity which means that their brain is capable of learning and adapting and performing the same functions, such as memory, in various places in the brain. 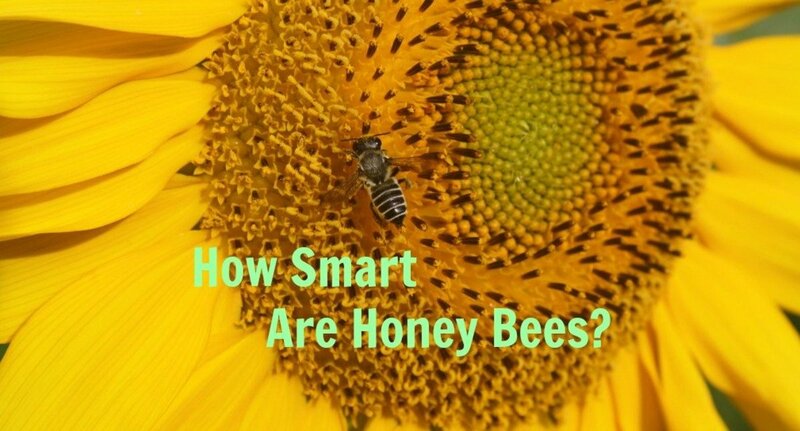 How Do We Know Honey Bees Are Smart? We know they are smart from observing their behavior and by conducting experiments that demonstrate their learning and memory abilities. They can identify and remember colors and landmarks. They can distinguish among different landscapes, types of flowers, shapes, and patterns. Bees can remember route details up to six miles over several days. They can conceptualize a map, determine the shortest distance between two points, and take a different route for their outbound and inbound journeys.They can navigate even in the dark. They are able to take on many different roles in their lifetime, each requiring different skills. The youngest bees are nurse bees, tending to the brood (the pupa or larva stage). Later they make the honey combs, forming perfect hexagonal shapes. Lastly, they become foragers, finding honey and bringing it back to the hive. They can distinguish harmful fungi from harmless ones. They can prepare medication (propolis) when harmful fungi are present. Experiments and observations show that honey bees do indeed have the ability to think. They have an ability to learn many new things very quickly. 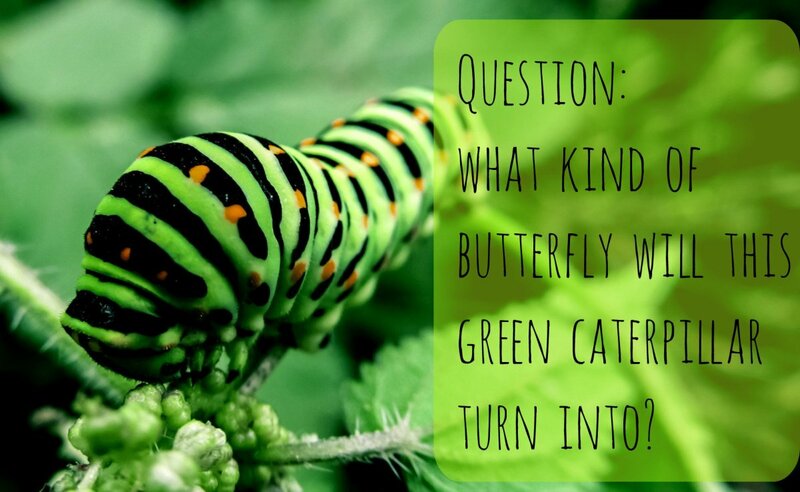 Compared to other insects, they have a much greater ability to learn and remember. They are capable of abstract thought, decision-making, and planning. They also show an ability to count and an understanding of time. The foragers have to perform many tasks that require intelligence-- they must find flowers, figure out if they are a good source of nectar, find their way back to the hive, and then share this information with the other foragers. They may be capable of cultural transmission. Experiments have shown that when one bee was taught to pull a string to get a sugary reward, another bee learned the trick just by watching the first bee. Even more surprising, they could teach this trick to other bees. When a honey bee finds a good source of nectar, she will return to the hive and tell the other bees where to find it by doing a dance to communicate both the location and quality of the source. There are several types of dances that are done on the honey comb in the darkness of the hive. 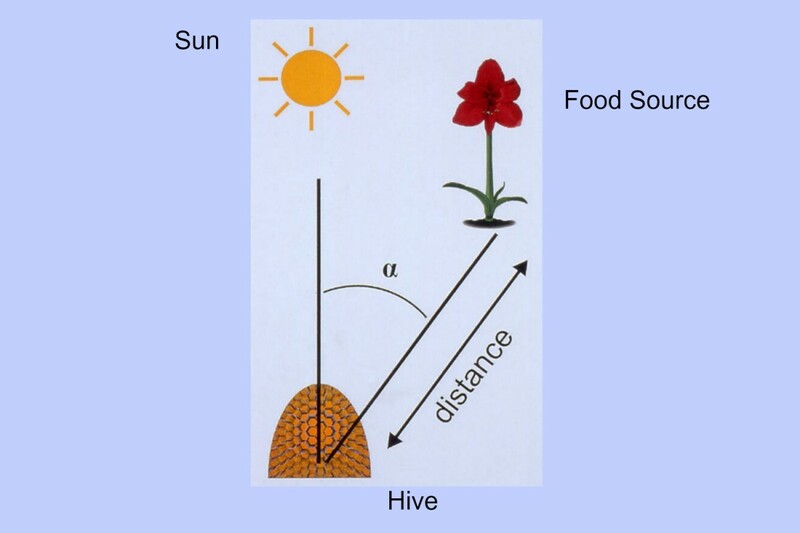 If the nectar source is further away, the forager does a “waggle dance.” The bee begins by walking in a straight line to indicate the direction of the food source relative to the sun. She then dances to create an angle which indicates the precise location of the food source relative to the sun. She waggles her body as she does this; the number of waggles indicate the distance. Imagine a line connecting the hive and the food source, and another line connecting the hive to the spot on the horizon just beneath the sun. The angle formed by those two lines indicates the location of the food source relative to the sun. The bee adjusts the angle of her dance to account for the fact that the sun is always moving across the sky. The dancer takes this into account and changes the angle of her dance every four minutes by one degree to the west. Finally, the time she takes doing the dance indicates the strength of the headwind. This tells the other bees how much honey they need to eat to have enough energy for the trip. A third type of dance is the tremble dance. A forager shakes her body back and forth, at the same time rotating her body axis by about 50 degrees every second or so, all the while walking slowly across the comb. It is done when a forager bee experiences a delay in unloading her nectar back at the hive due to a shortage of bees to receive it. It stops other nearby worker bees from flying to collect more honey and recruits more worker bees to the task of processing the incoming nectar. It functions as a mechanism for keeping nectar processing at an optimal rate by stimulating more bees to process the honey and inhibiting other bees from bringing nectar into the hive. The DVAV dance is another way of optimally allocating labor resources. A bee charges at another bee, pushing with her head and grabbing with her feet. She jumps on top of the bee and shakes her abdomen up and down. This action tells the second bee that a rich source of nectar has been found and more bees are needed to collect it. The second bee goes to watch the waggle dance and then joins the foraging efforts. There are a number of other types of dances. These are a few of them. The sickle dance is shaped like a figure- 8 and says the nectar source is close, but not real close. The jostling dance is a bee nudging other bees to get them to watch her waggle dance. The spasmodic dance is a form of the jostling dance that includes a bee giving the other bees a taste of the nectar. All of the hive occupants can release pheromones-- queens, workers, drones, brood, and even the comb. 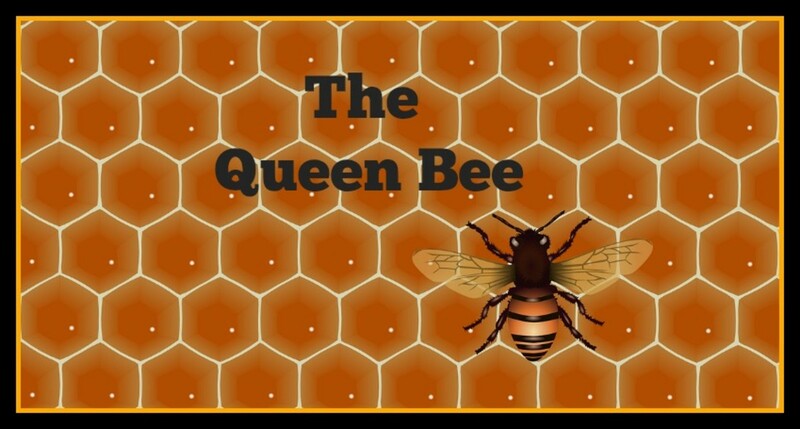 The queen has a special pheromone called the “queen’s substance” which is used to regulate the hive. The bees secrete pheromones to communicate many different things. The pheromones stimulate or suppress behaviors and also can be used to alert the hive to intruders. How Do Honey Bees Use Trophallaxis to Communicate? Trophallaxis is a fancy word for food sharing. One bee will ask for a taste from another bee by pushing her tongue towards the other’s mouth parts. The giver bee will respond by opening her mandibles, regurgitating a drop of nectar, and pushing it forward on her tongue so the other bee can taste it. During trophallaxis the antennae of the two bees will touch, allowing them to pass on scent messages. 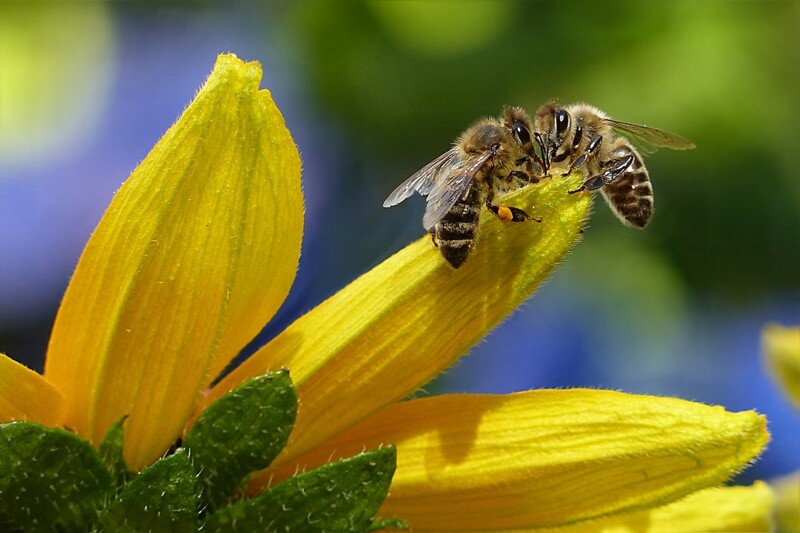 How Do Honey Bees Make Decisions? Foraging requires no central decision making. Each bee knows only about her own nectar source. If the nectar source is poor, she will quickly abandon it and will not do a waggle dance to direct her hive mates to it. Instead, she will watch the waggle dance of another bee who has found a good source of nectar and turn her foraging efforts to that source. On the other hand, if her source is good, she will work that source consistently and recruit other bees to join her. Each individual bee makes her own individual cost-benefit analysis, which affects whether or not she will abandon a source or recruit other bees to it. If she abandons her source, she will follow another bee at random; she does not compare sources. Since only bees with good sources are recruiting, the bee who has abandoned her source will almost certainly move to a better source. The result is that the entire hive has optimized foraging-- the decisions of thousands of individual bees lead to optimal collection of food resources. 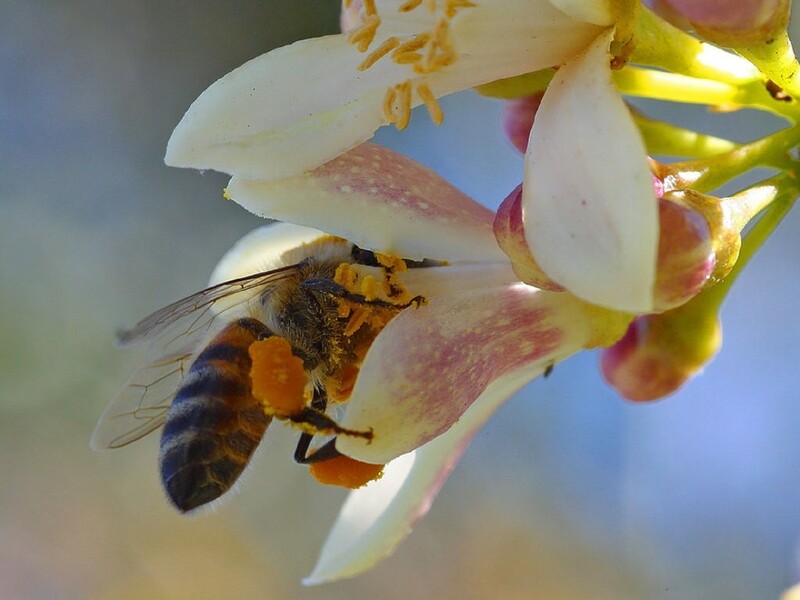 The value of a nectar source is not based only on the sugar content of the source—it appears that distance from the hive, weather conditions, the hive’s nutritional status, the depletion of the source, and other pertinent factors are all involved. What If Humans Had Bee Brains? 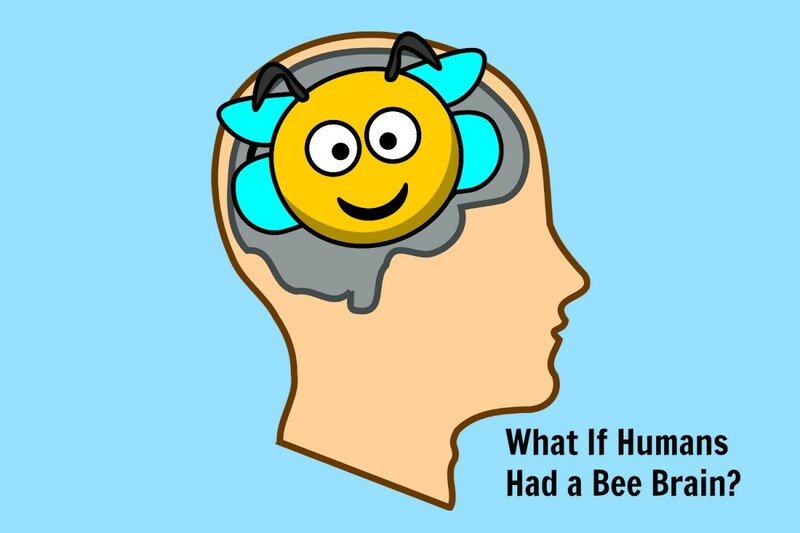 What If Humans Had A Bee Brain? Imagine how smart humans would be if our much larger brains had the capabilities of a bee brain. A bee brain brain is about 20,000 times smaller than a human brain. They have only 960,000 neurons in their brain compared to 100 billion neurons for humans. Yet they are able to do so much. Wouldn’t it be great to have an internal GPS? How do bees do it? Some say that they can sense the earth’s magnetic fields or the polarization of the sun’s light. A new theory is that the bee may be able to sense quantum fields or quarks. Wouldn’t it be great to have an internal clock that could tell time exactly? The bees seem to have some innate sense of the sun’s motion and location. Wouldn’t it be great to live in live in a cooperative community with a democratic process for making optimal decisions? Can bees be taught to organize? Bees do not have to be taught how to organize. They are "born" knowing how to organize. Bees are one of the most organized animal societies on Earth. Every bee in a bee hive has specialized duties. Patricia Scott: Thank you for your interest in honey bees. They are a very important part of the ecosystem and amazing little creatures. So much I did not know...thank you for filling in the gaps in my knowledge. I know how valuable and important they are to us and do all that I can to encourage them to hang around. Carson N: I am pleased I could help. Did it help with beekeeping or were you doing research for a school assignment or for your own article about bees? Thanks for your comment. This article helped me with my project thanks so much! bravewarrior: Bees continue to amaze me in so many ways. They are so highly evolved--and very smart. Perhaps if someone calls you a bee-brain, they mean it as a compliment. Thanks for your comment. Bees' various dances are fascinating, Catherine. What a way to communicate! And they're talented mathematicians to boot. Smart and artistic. Seems we humans can learn something from these tiny creatures. Claire: Congrats on becoming a beekeeper. It is such a rewarding activity. Mu suggestion is to find a local beekeeper association and join it, if you have not already done so. Hello! I'm just getting started and have my hive box! Now placing it and getting the Queen and bees! I enjoyed your article very much! 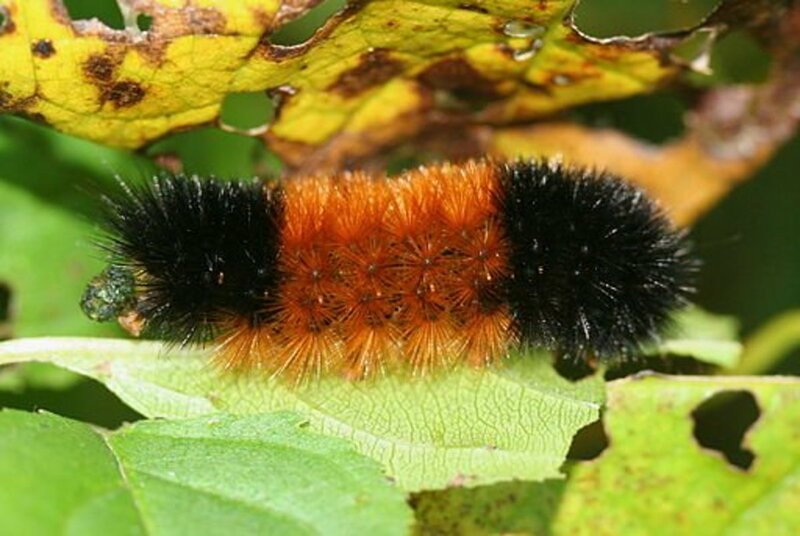 Hopefully, I'll learn some more about these critters and what all I have to do to keep them happy and productive!! Chitrangada: You make a very good point. Birds may also have more intelligence than we give them credit for. Maybe being a bird-brain isn't an insult at all. And being a bee-brain is very high praise. Nature is indeed full of amazing things if we stop to look for them. Thanks for your comment. Paula: I see you like bee puns. You should take a look at my hub "The Bee's Knees". It is full of bee puns. Now that I know how smart bees are, I also can't look at them same way. Thanks for your comment. Grand Old Lady: It is so nice of you to tel me how much you liked this article. The bee "dances" are a kind of sign language; each part of the dance provides information. Excellent hub and very well presented! Honey bees are no doubt very intelligent! The Nature and it's creatures are just amazing and we can always learn something from them. I sometimes feel amazed to see the birds and how they weave their nests. All these creatures are so systematic, methodical with a great sense of time , direction , weather and what not! Thanks for sharing this interesting, informative and enlightening hub! Wow! Catherine, you write wonderful hubs no matter the topic! Thanks for this education. Did I know bees were so stingingly smart?? No I didn't, but thanks to you, I do now and it's all very fascinating to me. I don't think I'll ever look at a bee in the same way again! Have a great week-end and BEE HAPPY! MsDora: I will never look at bees the same way again. Bees are using a complex symbolic language--and no other insect or animal does this. It might be like when experimenters teach gorillas how to use sign language, except no one has to teach it to the bees. Thanks for the comment. By the way, I had to leave so much information out because the piece was getting too long. I might have to do a second piece on this topic. FlourishAnyway: You are so right.Humans don't see the intelligence of other animals with whom we share this planet. My research on bees has got me thinking about what other animals we are underestimating. Thanks for your comment. janshares: Thank you for your comment. Researching this piece was finding one astounding fact after another. The last section of my essay was written because I really do think bees are smarter than humans taking into consideration the tiny size of their brain. Especially interesting is their communication by dance, and humans can benefit by practicing their spasmodic dance, focusing on the intent. Altogether, their intelligence makes them admirable creatures. Thanks for all these amazing facts. Truly remarkable creatures to be able to decide and communicate in these ways. There is so much intelligence in non-human animals we have yet to discover and appreciate. I am stunned. This is amazing. This information about honeybees blew me away, Catherine. It just made me respect even more the power of nature and God, with the ability to create all of us in our uniqueness. But the honeybees? My goodness, they seem to be above all of us, with that little brain, no less. Thanks for an interesting article. Heidithorne: Thanks for making me smile with your "Dancing with the Stars" reference. I'm pleased that you took the time to read, comment, and most of all, appreciate the bees. Peggy Woods: Thanks for your comment and for sharing on pinterest. The more I learn about bees, the more I stand in awe of them. Gwenneth Leane: I think beekeeping is a wonderful hobby. Pollinates your garden, gives you honey, and you get to study these marvelous little creatures up close. Thanks for your comment. What a great article about a wonderful kingdom. I look on the swarm as a kingdom ruled by the queen. I used to keep two swarms in my garden, when I had more land than I have now and take the honey. The bees were also kept to pollinate our fruit trees and vegetable. This is fascinating information regarding how smart honey bees are and how they communicate with one another. I enjoyed this! Pinning to my Do You Know This board. They are so ready for Dancing with the Stars! :) There is so much intelligence in nature that we still don't fully understand. Thanks for sharing this interesting info!